This post was written by Melinda Fine and Steven Laworiginally appeared on TCC Group Blog. The speculation for most of us began on Wednesday morning, November 9, 2016. Regardless of political affiliation, the election win by a presidential candidate who promised dramatic changes in governing style and policies from the prior administration meant that grantmakers might have to rethink their current strategies and, quite possibly, fundamental priorities. As the new administration’s policy agenda rolled out over its first year in office, the interest areas of more and more funders were touched by the shifting political landscape. Beyond the impact of these policy changes on individual grantmakers, we began to ponder what this meant for the field of philanthropy as a whole; not just grantmaking institutions, but also the many philanthropy-serving organizations (PSOs) and funder collaboratives that exist to strengthen funder effectiveness through joint learning, alignment, and action. We wondered whether the initial flurry of conversation had led to more formal engagement and even collaboration in responding to the evolving policy priorities. And, if it had, what was the type and scale of their responses? Were they timely? Did they have the potential for catalyzing longer-term changes in the sector? To begin to answer these questions we talked with nearly 30 leaders of PSOs and funder collaboratives in advance of the first anniversary of the new administration. Frontline partners for grantmakers and close observers of trends across the sector, these leaders described a philanthropic field demonstrating flexibility, nimbleness, and a willingness to collaborate that can serve as a model of creative adaptation for the sector going forward. They also identified enduring challenges for the sector that have been amplified in these unpredictable times. PSOs played a critical role in enabling funder learning, dialogue, and action. The speed of policy change in the new political environment intensified the need for funders to be well-informed. PSOs were often the first call for grantmakers and have since engaged in supporting funder learning, facilitating funder networking and aligning support, enhancing opportunities for collective response, and supporting efforts to help bridge divergent perspectives among staff and boards. 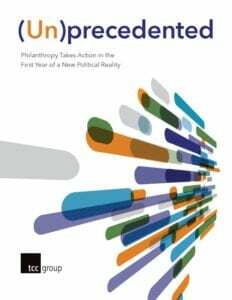 The new environment accelerated important funder conversations.At least three ongoing conversations in the field of philanthropy have received an explicit boost from the current political environment. These include the importance of continuing to grow the sector’s focus on diversity, equity, and inclusion; the need to think beyond issue silos and employ intersectional approaches; and the foundational benefits of creating space for dialogue across political and ideological divides through support for nonpartisan civic engagement. While some funders remained cautious, others embraced their public voice. According to PSO leaders, not all funders expressed a need for immediate engagement in the new political environment. A few interviewees described funders who had taken a “wait and see” approach. Yet, the impact of rapidly changing policies led a greater number of funders to consider aligning their “institutional voice” with other grantmakers to maximize their potential impact. Several PSOs referenced taking the lead in crafting and coordinating shared funder statements, which created a certain measure of “strength in numbers” and undoubtedly contributed to the willingness of some to lend their name to a public position. Will the philanthropic sector demonstrate a sustained commitment to shared learning, collaboration, and speaking up in response to the evolving policy environment? Will these practices permeate grantmakers’ other funding priorities? Throughout 2017, more funders showed themselves to possess the adaptive abilities necessary to make a difference in the twenty-first century. The years 2018, 2019, and beyond will show just how pivotal this political epoch will ultimately be for how grantmakers do their work and make a difference going forward.